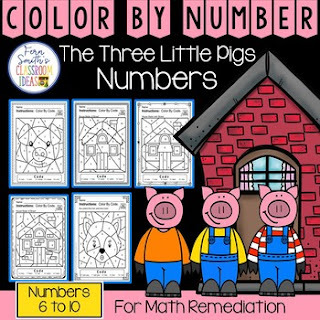 Color By Number For Math Remediation Numbers 6 to 10 With a Cute Three Little Pigs Theme - Fern Smith's Classroom Ideas! If you are looking for a resource for math remediation while still giving your students some confidence while reviewing important math skills, you will love this series. These five Color By Number worksheets focus on Numbers 6 to 10 with an adorable Three Little Pigs theme. The five pages have only a few color selections and only a few numbers, to help your students focus on the repetitive pattern of numbers 6 to 10. All the while giving your students a fun and exciting review of important math skills at the same time! You will love the no prep, print and go ease of these printables. As always, answer keys are included. * Five Pages with Numbers 6 to 10.